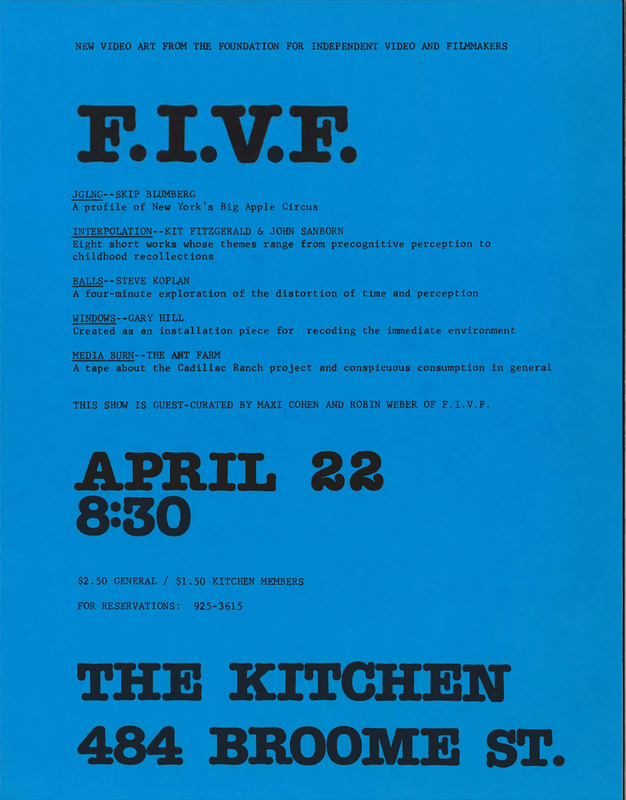 In 1979, the Foundation for Independent Video and Filmmakers (FIVF) presented a three-part collaborative series at The Kitchen that featured videotapes from artists involved in the foundation. This screening was the second of the three slated FIVF shows; the third show did not materialize. FIVF was established in 1975, at a moment when there was limited support for experimental filmmakers who operated outside of the Hollywood studio system and television networks. Venues like The Kitchen provided a critical venue for film and video artists to screen their work and experiment with each other. Videotapes from FIVF was curated by Maxi Cohen and Robin Weber, members of the foundation.